Stopped for a piss on Sunday’s ride and what was all this? 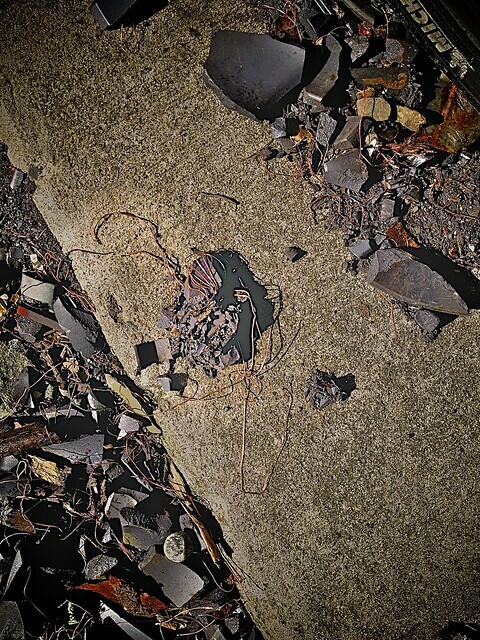 Pieces of plastic strewn about, copper wire everywhere, and then I figured out I was standing in the remnants of a television. A tweaker had smashed it apart for the copper wire. Not sure how much Tweak got, doesn’t seem like a lot, and there was a trail of copper strands on the path where he must’ve ran away. Of all the strange things I’ve seen when riding, this was one of the saddest. A life reduced to this. Nearby, a few pedal strokes away is a homeless camp. They probably kicked him out of there.